ATAL UK are experts in structural waterproofing specialising in roofing and basements and offering a high quality of service from design to installation. ATAL UK wanted an automated system that would help improve their sales process and allow them to handle a higher volume of sales without expanding the salesforce. ATAL UK wanted to be able to log all potential sales in the system to be able to track pipeline revenue and see what potential projects are closing in any given month. In addition, they wanted to be able to track the following against the potential project, ie. sale. The status of the sale - quoted, under review, lost, won etc. Not stopping there, as ATAL UK undertake projects all over South Wales and Southwest England as far as Cornwall, Mr. Dave Rees, Managing Director of ATAL UK, wanted his sales team to be able to access client information and current sales status, and update their tasks status plus log call and meeting notes on potential/ongoing projects, at the project/client location in real time. As the construction industry involves many 'players' in the construction process, they needed the system to be able to associate people such as contractors, architects, designers, procurement managers, project managers and many more against a potential project so that they know immediately who is involved in the project and how to get in touch with them. Currently all documentation related to the construction projects was being kept either on local hard drives or Google Drive or on hard copies in project folders in the office. ATAL UK therefore needed to be able to store numerous kinds of documents on the potential sales such as technical drawings, contracts, invoices and so on. ATAL UK were using MailChimp to send mass mailed to their customers and leads. Whilst MailChimp is a great email marketing solution on its own, it does not have a fully automated two way synch between Zoho CRM, which contains Leads and Contacts that are added to on a daily basis, as well as a synch back to the CRM, of campaigns done and campaigns stats. Finally, ATAL UK wanted to be able to not only see the progress of a potential 'project' (ie. a potential sale) during the sales process, but also when a project has been won and is in progress. This involves logging project milestones, tasks and owners, as well as documentation related to the project, from development documents, additional design material and even project images showing progress or issues. Integrated Tools from the Zoho Suite of Small Business Software! The initial step was to implement Zoho CRM so that ATAL UK had a platform to manage their leads, accounts, contacts and sales. Various fields were customised to match the ATAL UK business model, for example the lead source field, which allows the team to show the various sources they use and training was given to show how to import data that had been selected from their Barbour construction lead account into Zoho CRM. And job titles, which tend to be fairly consistent in the construction industry, were put into a drop down field and the free text field was replaced. The sales stages too, were very specific to the construction industry to all of these were changed and the % certainty mapped to how ATAL UK requested. Web to Lead code is now used to capture leads to the CRM directly from the ATAL UK website and there are future plans to integrate their Zopim live chat module to the CRM too, so that any website chats that come in can be dropped into the CRM as leads; or recommend the new Zoho Sales IQ. The name of a future sale in ATAL’s language is ‘Project’, so we changed the module name for them and staff are now logging all potential projects in the CRM along with the correct stage and various other data fields that are needed for the business. In addition they are now logging all of the related contacts in the project along with custom contact roles that they play in the project life cycle. Finally, Dave Rees, the Director of ATAL UK and his sales team, are now using this on their mobile devices and are able to log project notes / call notes and check status of potential projects via their mobile phones using the mobile Zoho CRM app. Back at HQ Ian and Dom use the Attachment feature to upload files such as technical drawings and other design documents plus contracts and so on, to the relevant project, so that everything is at hand as and when it is needed. There are plans to develop the Documents module or implement Zoho Docs to centralise all of the company documentation to one web location. 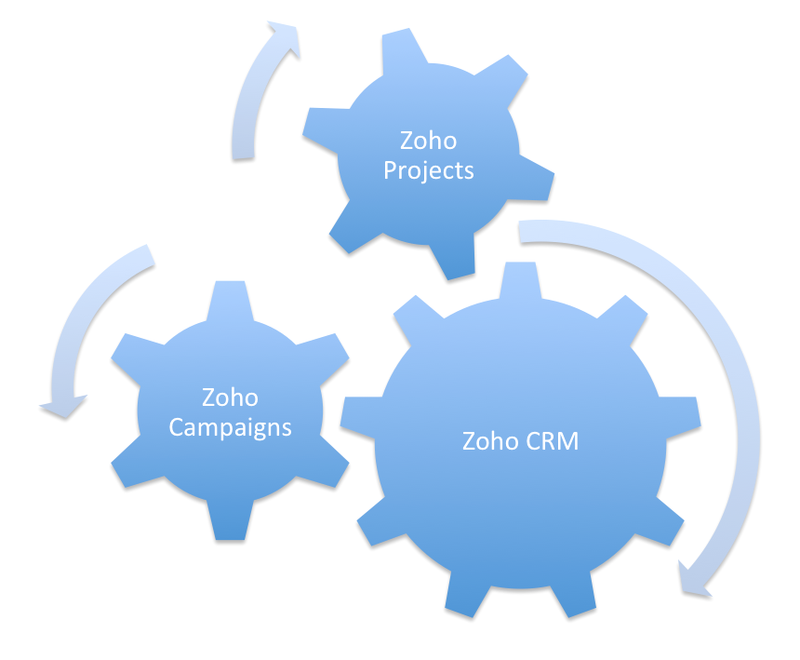 Zoho CRM has also been integrated to Zoho Campaigns so now all of the Leads and Contacts synchronise on a daily basis to Zoho Campaigns and can be targeted accordingly. Their old MailChimp newsletter list has also been migrated and newsletters are now sent via Zoho Campaigns and stats such as reads, clicks, bounces, location etc can be gathered from there and is synchronised back to the CRM automatically as campaigns each time an email is sent out. By migrating to Zoho Campaigns to provide them with a single platform for all of their CRM and email marketing needs, Atal UK are now able to create targeted views (lists) in Zoho CRM, synch them automatically to Zoho Campaigns, carry out email blasts to these lists and then view the stats in Zoho Campaigns or even in Zoho CRM itself via the 'Campaign', which gets created automatically in the CRM every time you run an email campaign! The long term benefits of this of course are that if you get any new leads as a result of your email campaigns, they can be pushed to the CRM automatically via a web to lead form then converted to sales, then you have the return on investment (ROI) information of the resulting sale, logged against that specific campaign, right at your fingertips. This is simply not possible if you use a separate CRM and email marketing solution. Last but by no means least, a ‘Project Portal’ has been created for ATAL UK using Zoho Projects and this is being used for internal projects during the initial learning phase, allowing the team to create milestones and tasks to track business development related work amongst the team. This will be expanded once the guys get used to the app, to include client construction projects as well and then will include the foreman, client users, Account Managers, and so on, giving an effective project management tool for the company. More plans are afoot to develop the Zoho platforms in line with the growth of the company. With our flexible Zoho support packages we are able to offer ATAL UK the support they need, when they need it, at a budget that is appropriate. We wish ATAL UK all the best in the future. Click here to see an infographic about 'integrated office solutions for the construction industry'. We have extensive experience implementing CRM solutions in the construction industry. If you would like a free consultation on how a CRM and other cloud business software can be of benefit to your business, please get in touch with us on info at mangoho dot com or via our web form, here.